Merriam-Webster defines Stress as “a state of mental tension and worry caused by problems in your life, work, etc. ; something that causes strong feelings of worry or anxiety. Stress is a topic that gets a lot of attention because it can be unhealthy and there are a number of action steps that are published which can be very helpful for managing stress. 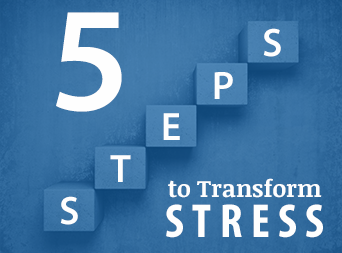 Let’s take a different look at how recognizing stress as a wake-up call can be transformational by building a tremendous amount of awareness of what is going on and what you can do about it. Stress shows up in the body in different ways for different people. You may feel it as a tension in your neck or back, sweaty palms, tight throat or a knot in your stomach. When this happens, it is time to notice what is happening and why. Here are some steps to delve a little deeper into what might be going on with regard to the anxiety you are feeling. Explore your resources. When you have multiple projects and requests and a feeling of too much to do, prioritize what’s most important. What resources do you have and what resources do you need to assist you with the process? It is ok to say no, or at least that you are able to get to it on a particular date. Also, notice what is wasting your time and energy. If you are spending time on things that are not a priority and procrastinating on the things that are, find out why. Do you need more resources? Do you need assistance? Effectively interact with curiosity. Interacting can sometimes be stressful. Have you ever avoided interacting with someone because you believe you don’t have anything in common with them? Having commonality can be a driver or, rather a drive-away factor, when entering into conversation. Focusing on where you think you don’t have commonality will deepen the discomfort. Try being curious about the other person and discover where there may be commonality, even if it is only the fact that you both work in the same organization. Look resistance in the face. Resistance usually follows fear. You might not like to admit the fact that you have fear and prefer to say you just don’t want to do something. That may be the case, but when the task is necessary and you just don’t want to do it, what are the assumptions, beliefs or concerns that keep you from moving forward? Fear can be very subtle and checking in to see the underlying message can be very transformational. Sometimes messages are old but continue to repeat themselves in our minds, bringing uneasiness and frustration to our consciousness. What is the old message? Is it still true? What may be a new way to approach or view the matter? Visualization is a powerful tool. You can create powerful outcomes for goals you want to achieve. One method is to get centered, as though you are going to meditate, by getting comfortable and focus on your breathing. This can be done sitting up or lying down. I like to feel my feet firmly grounded as though roots are extending through the bottom of my feet into the earth. Choose the outcome you want to visualize and bring it into focus as though you are watching a movie. See yourself in that scene exactly as you would like it to be. Feel what it will be like when you have this outcome. Let yourself feel the joy, contentment, exuberance or sense of satisfaction. Make this a regular habit of seeing and feeling this as though it has already happened. This technique can be used for little projects or major changes. I know because I have experienced this and I have even transformed chronic pain into being pain free. Set an intention and make a commitment. Setting an intention is more powerful than defining a goal. Goals are great and necessary to achieve things you want to achieve and even those things you are not that engaged in doing. Accomplishing the goal is easier when you set an intention. It puts things in motion. Now make a commitment. Making a commitment is powerful when you really want to do something. When you are aligned with what you intend to do, it does not feel like work. It is not a negative stressor. It is a motivator that creates energy rather than drain energy.